1/2 x 26 - Tap Set (set of 3). Highest Quality. Free UK Shipping. BSCY. HSS M2 High quality General Purpose Taps, Ground Thread available in sets of three and also individual taps. Right HAND Cutting, Straight Flute. 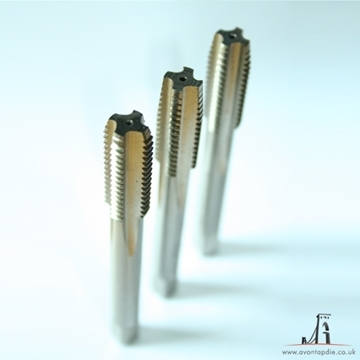 Set of 3 taps including Taper, Second and Bottoming (Plug) taps. You can specify individual taps from the product menus or by calling us directly and quoting (TS) BSCY 1/2 x 26 pitch 26. 3 -12mm tap wrench.